While the Big 12 is still on the outside looking in for the Playoff, it still has a slim chance at getting into the field, and that team would most likely come from this matchup. After a 1-2 start, Oklahoma has been flaming hot, thanks to a dominant offense. Oklahoma QB Baker Mayfield has been outstanding, throwing for 3,212 yards 33 touchdowns, and can change games with his electrifying playmaking ability. 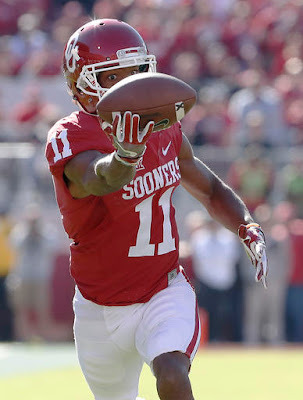 He will be teamed up with star backs Joe Mixon and Samaje Perine and Biletnikoff Candidate Dede Westbrook (nation's best receiver). West Virginia's defense has had some troubles under head coach Dana Holgorsen over the years, but it has been great this season. Shutting down the versatility on the OU offense will be tough, but the group has the experience and discipline to hold their own. The Sooners could have a tough time on the other side of the ball, as West Virginia knows how to move the ball. Veteran quarterback Skyler Howard has a huge arm and will hope to further expose the Sooners' struggling secondary. Also hurting the Sooners is the fact star defensive linemen Charles Walker quit the team this week to prepare for the NFL, significantly hurting Oklahoma's pass rush. The Mountaineers aren't a great rushing team, but they could find some success against an inconsistent Oklahoma rush defense. Justin Crawford is averaging over six yards a carry, and Pitt transfer Rushel Shell could also give the Sooners' some issues. This has all the makings of a typical Big 12 shootout, especially with the way Oklahoma's defense has been playing. The Mountaineers are more balanced and have a stronger defense, but this is also a team that has struggled with consistency, and the Sooners have looked unstoppable since their rough start. Even in Morgantown, OU should be able to find success, and has more experience in big games. It could be a battle, but the Sooners should be able to get the job done. Few could have predicted we would be deep into November, and the Pac-12 Division leaders would be Colorado and Washington State but yet here we are. The Cougars opened up the year with a loss to FCS opponent Eastern Washington and then Boise State, but have terrific since then. The Cougars are now 7-0 in the conference, and pounded Stanford 42-16. They are led by their usual air-raid attack, with quarterback Luke Falk distributing to a strong cast of weapons on the perimeter. Falk has a huge arm and has been on fire over the past couple weeks. All-Conference receiver Gabe Marks gives Falk a reliable option to work with and do some damage against Colorado's secondary. The rushing attack has never been great under Leach, but it has been better in 2016. On the other side, Colorado has been one of the biggest surprises of the '16 campaign. The Buffaloes haven't gone to a bowl since 2007 before breaking out this season, now 8-2, with their only losses being to Michigan and dangerous USC. Much of it can be attributed to the play of their offense, which has broken out after an uneven few seasons. Veteran Sefo Liufau is one of the top passers in school history, but has missed some time due to injury, opening up the door to redshirt freshman Steven Montez. Montez will see some action, but Liufau knows how to get the job done. Liufau also could strike fear into Washington State's defense with his dual threat ability, as he has run for 316 yards and three scores on the season. Paired with veteran tailback Phillip Lindsay, rushing for 937 yards and 13 touchdowns on the season himself. The Cougars' defense has been criticized for their struggles under Leach, but the group has shown more fight this season. Colorado may have lost top wide out Nelson Spruce, who opened things up over top for the Buffaloes last year, but Shay Fields and a number of others have stepped up. Washington State has given up plenty of deep passes all season long, which could be a big problem. Both of these teams are en route to a Pac-12 Championship berth, and they both have their motivations to win another game that should feature plenty of scoring. It could come to whoever wins the turnover battle, as both offenses have struggled to hold on to the ball at times this year. Washington State has been on fire as of late, and they have beaten more quality opponents than the upstart Buffaloes. Also, Falk is a star and has played in bigger games than anybody Colorado has on the other side. With that in mind, Washington State should be able to keep it going, and set up a huge Apple Cup battle with Washington. Aside from their loss to Alabama in which they couldn't do anything offensively, LSU has been very good under interim head coach Ed Orgeron, and seems to have more energy under the former D-Line coach. Orgeron has been helped by the healthy return of Leonard Fournette, who was limited earlier in the campaign. However, there have been reports of Fournette still struggling with an ankle injury, and it remains to be seen what his future may hold. If he can't go or needs limited carries, backup Derrius Guice has already proven he can run wild in the LSU offense. Purdue transfer Danny Etling hasn't been perfect since he took over starting quarterback duties, but has given the offense more efficiency. He'll have a tough task against the dangerous Florida secondary. Jalen "Teez" Tabor is well known for being a shutdown corner and he will be up for the challenge against the Tigers' physical receivers. In fact, the entire Gators' defense should be on full display. The group continues to be terrific, allowing just 13.3 points per game, fifth in the nation. With the speed and athleticism the defense possesses, LSU will not get anything easy. While the "D" continues to dominate, the same old offensive problems continue to haunt Florida. The passing game has lacked any diversity, and the Gators simply don't create any big plays. Against an LSU defense that is astoundingly tough and talented, the Gators will have a tough time. Quarterback is a question for UF right now not only because the position hasn't been great for much of the season, but because the starter has been injured. Former Oregon State and Alabama transfer Luke Del Rio has had some moments, but has missed a big chunk of the year. The Gators are hopeful he will be ready to go this weekend but if he doesn't, they will turn to their own Purdue transfer, Austin Appleby. The questions at QB can be mitigated by the explosiveness of sophomore receiver Antonio Callaway, but they will still have to throw into a Tigers' defensive backfield that is also dominant. Corner Tre'Davious White and ball-hawking safety Jamal Adams are fearless and hungry. Unless Florida can find some success running the ball or the passing game miraculously takes some huge steps forward, the group will not score much in this one. While CU-WSU and Oklahoma-WVU will have plenty of scoring, this one should be the exact opposite. It has all the looks of a SEC slugfest, and one that will be hard fought, especially considering the Gators are trying to lock down the SEC East title. While Florida's defense will keep them in the game, they struggled to contain LSU's ground game in this matchup a season ago. If Fournette is a go, the Tigers should be able to pound the rock all day long. If Etling can make some big throws and the defense does their job, LSU should give their home crowd plenty to cheer about.